Om man tittar på hur mycket det utvecklas just nu för Bitcoin, både inom mjukvara och antalet startups, går det att förutspå en ljus framtid för kryptovalutorna. Bitcoin pulse tar pulsen på just detta och visar tydliga grafer på hur tillväxten ser ut inom olika områden. If you think developers predict the future then there is more reason to believe that Bitcoin is the real deal. The crypto currency is a hit with developers, according to data collected on GitHub by the founders of Bitcoin Pulse, a service recently launched that tracks Bitcoin adoption. Bitcoin Pulse tracks the data related to Bitcoin on core services such as Coinbase, Coinmapand Github as well as investment services, consumer services and discussion groups. It also shows the latest exchange rates on Mt. Gox, BTC China and services such as Bitstamp. But it is the tracking the group does about developers that shows why the online currency holds such promise. 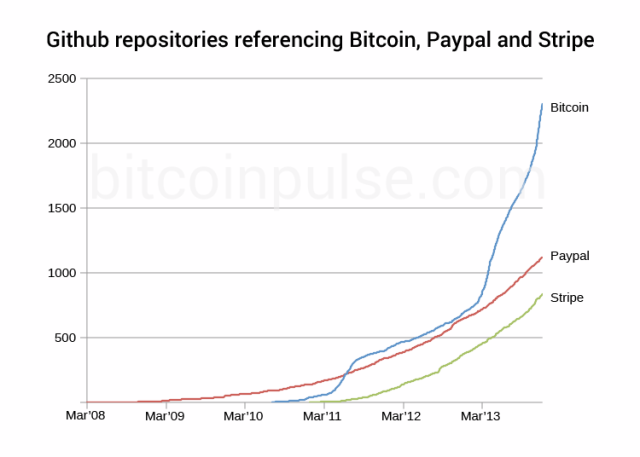 That is illustrated by the increase in GitHub repositories that mention Bitcoin, according to a blog post by Bit Pulse Co-Founder Flavio Rump that explains how they are tracking Bitcoin through GitHub. Rump did a search query for Bitcoin, Paypal and Stripe. The data shows that Bitcoin grew by 17.8 percent over the 30 days from November 15 to December 15. In the same period, Paypal grew by 4.4 percent and Stripe by 6.3 percent. There is not much of a market comparison between Bitcoin, Paypal and Stripe, Rump admits. But he is more interested on showing the developer mindshare for the currency. Developers are the first to adopt new technologies. And GitHub has become the place where to track emerging and trending technologies, Rump says. Most developers working with modern tools have a GitHub account. They tend to share their projects and contribute to open-source efforts. The developer interest mirrors Bitcoin’s tremendous media hype but its relative primitive state also makes it a challenge that intrigues developers. For example, Bitcoin depends on user having security on their own devices, said Elliot in a recent phone interview. But people often do not know if their computer have been compromised. Bitcoin is just so new. People have depended for years on the banks to provide security for their money. With Bitcoin that layer of protection that banks provide is not there. People are on their own and the dangers of getting robbed are very real. Developers see that security gap as a challenge, a problem to solve. But it’s really more than that. Bitcoin is open-source and equity-based. It encompasses economics, accounting and multiple other markets. It serves as an alternative to our monetary system. It’s a challenge to government, political systems and the companies that have prospered over the past several decades. Proof of Bitcoin’s disruption is evident, for example, with credit card companies, which have not adapted as well to the online currency movement. And as a result, it has financial support. Coinbase raised $25 million earlier this month and Circle Internet Financial, led by former Brightcove CEO Jeremy Allaire, has $9 million in funding to build its payment platform for consumers and merchants. The funding correlates to the surge in development for the Bitcoin platform, which Allaire says is now similar to Mosaic, the first version of the Internet browser. What Bitcoin needs now more than anything is development. If that happens, then the future will happen as it often does with developer-driven technologies. januari 6, 2014 i Bitcoin nytt, Ekonomi, Utveckling. ← Ett nytt spännande år! Välkommen 2014!